'Time' Person Of The Year For 2018: Journalists Fighting 'War On Truth' Time calls the four journalists and a news organization "Guardians" in a struggle against lies and misinformation that has pit news agencies against political groups and governments. 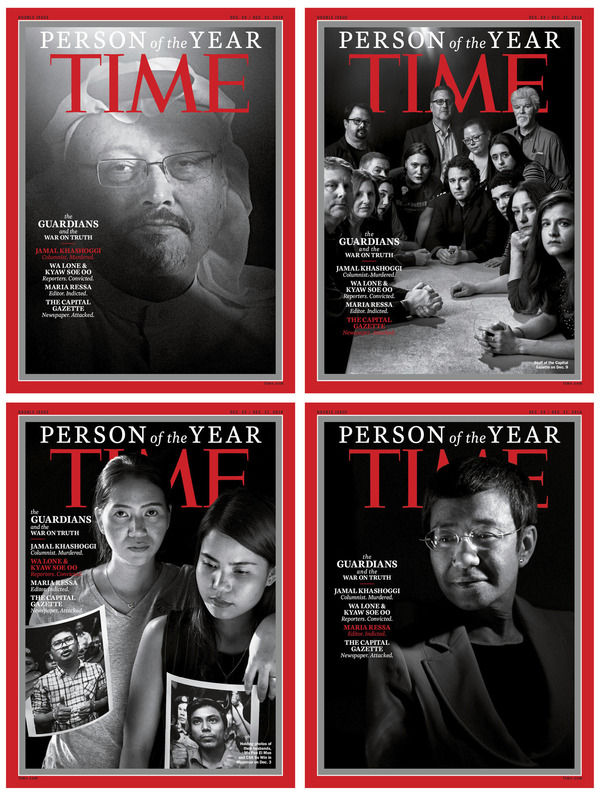 Time magazine is printing four covers for its "Person of the Year" issue, featuring (clockwise from top left) slain Saudi journalist Jamal Khashoggi, members of the Capital Gazette news organization, Rappler news site chief Maria Ressa, and Reuters journalists Wa Lone and Kyaw Soe Oo (via their wives). Time has chosen a group of four journalists and a news organization as its Person of the Year for 2018, hailing them for "taking great risks in pursuit of greater truths" in what the magazine called a "war on truth." Its upcoming edition highlights slain Saudi journalist Jamal Khashoggi and staff members of the Capital Gazette of Annapolis, Md. ; along with journalists punished for attempting to report facts: Maria Ressa of the Rappler news site in the Philippines and Reuters journalists Wa Lone and Kyaw Soe Oo. They are being featured on four different covers, with solemn black and white portraits. Time calls them the "Guardians" in a struggle against lies and misinformation that has pit news agencies against political groups and governments. Because Wa Lone and Kyaw Soe Oo have been imprisoned in Myanmar, their photos are held by their wives, Pan Ei Mon and Chit Su Win. The issues will hit newsstands later this month, in the final edition of the weekly magazine for 2018. In addition to the main recipients, Time cited numerous examples of journalists who have been attacked in the course of their work, from Bangladeshi photographer Shahidul Alam to journalist Amal Habani in Sudan, reporter Patricia Campos Mello in Brazil and Financial Times editor Victor Mallet in Hong Kong. "Worldwide, a record number of journalists — 262 in total — were imprisoned in 2017, according to the Committee to Protect Journalists, which expects the total to be high again this year," Time says. While attacks on the press in places such as Mexico, the Philippines and Venezuela have drawn widespread concern, the United States has also become a battleground in the war on "fake news" — a term that refers to propaganda, but which President Trump and others use to refer to stories that don't match their views and/or portray them in a negative light. This year, the U.S. fell to No. 45 in the World Press Freedom Index compiled by Reporters Without Borders, putting it behind Romania and South Korea. The index measures the "level of freedom of information"; two years ago, the U.S. was ranked 41st out of 180 countries. "We are putting out a damn paper tomorrow." After a gunman killed five people in the Capital Gazette newsroom in Annapolis, Md., in June, reporter Chase Cook was defiant, vowing to push on and bolstering his colleagues. The news organization's journalists continued to report and share information following the devastating mass shooting. "I'm going to hold my government accountable for publicly calling me a criminal." Maria Ressa, CEO of the digital news outlet Rappler, flew home to the Philippines last week despite facing arrest and a possible 10-year prison term. The former CNN bureau chief had been visiting the U.S. to accept prestigious journalism awards. "Today is a sad day for Myanmar, Reuters journalists Wa Lone and Kyaw Soe Oo, and the press everywhere." The two journalists reporting on violence against Rohingya Muslims in Myanmar were sentenced to seven years in prison in September, on charges they illegally possessed official documents — which the news agency says they had neither sought nor read. Reuters editor-in-chief Stephen J. Adler noted his agency's reporters had already been in prison for nearly nine months when they were sentenced. "His corpse has still not been found." Slain Washington Post columnist Jamal Khashoggi was killed in the Saudi consulate in Istanbul as he tried to arrange paperwork for his wedding. His body has not been found, and his fiancée, Hatice Cengiz, says her pain has not eased because he has not been buried. Last week, Senate leaders who were briefed by CIA Director Gina Haspel said they're convinced Saudi Arabia's Crown Prince Mohammed bin Salman was behind the killing. This is the second consecutive year Time has selected a group of people as "Person of the Year," after the 2017 winner, the #MeToo movement. In choosing the recipient, the magazine seeks to recognize the most influential newsmakers who also represent what was most important about a specific year — "for better or for worse," as former Time Managing Editor Walter Isaacson wrote in 1998. The shortlist of candidates for the 2018 award ranged from President Trump to special counsel Robert Mueller, and from families separated at the U.S.-Mexico border to the March for Our Lives activists against mass shootings. Those in the running also included Black Panther director Ryan Coogler and Christine Blasey Ford, who came forward with sexual assault allegations against then-Supreme Court nominee Brett Kavanaugh. In recent years, "Person of the Year" winners have included Donald Trump (2016), German Chancellor Angela Merkel (2015) and Ebola fighters (2014).